The excellent optical properties of diamond have been known for a long time. However, optical applications require extended discs or thin coatings not provided by natural diamond crystals. With the development of CVD techniques the situation has changed completely. Diamond is transparent from the UV (230 nm) to the far infrared. Only minor absorption bands resulting from two phonon absorption exist between 2.5 and 6 µm. Hence diamond is an ideal material for multispectral optical applications. No thermal generation of charge carriers at elevated temperatures, hence no "thermal run away" as in the case of Germanium under laser irradiation. Furthermore, diamond does not become nonlinear at high radiation intensities. Absorbed energy is quickly dissipated to the edges of a diamond window where it can be removed by appropriate heat sinks and cooling techniques. Diamond is extremely hard, wear resistant and chemically inert. It is an ideal material for hostile, highly erosive atmospheres. material at room temperature (20-25W/cmK), exceeding that of copper by a factor of five. Today, CVD diamond is used for various thermal management applications such as submounts for integrated circuits and heat spreaders for high power laser diodes. Diamond is known for its extreme hardness. It exhibits an exceptional wear resistance and a low coefficient of friction. These properties make CVD diamond an ideal choice for highly demanding applications such as cutting tools for non-ferrous materials, surgical knives and wear resistant coatings. Thermal conductivity of CVD diamond vs. temperature. For comparison, the thermal conductivity of copper is shown in red. CVD diamond exhibits remarkable dielectric properties including a low dielectric constant of 5.7, a loss tangent below 0.00005 at 145GHz and a high dielectric strength of 1 000 000 V/cm. In combination with the extremely high thermal conductivity, low thermal expansion coefficient and high mechanical strength CVD diamond is an ideal dielectric window material. In particular for high-power microwave tubes (Gyrotron) with power levels exceedings 1 MW edge cooled diamond windows have found tremendous interest. 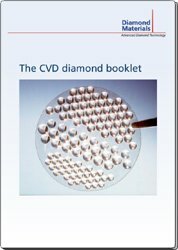 For a comprehensive summary of the properties of CVD diamond you may want to download the CVD diamond booklet provided by Diamond Materials.